Over the last two days we’ve seen how it’s foolish to divide over leaders: they are simply God’s servants who are on the same team, with different roles that work toward the same goal. That goal is the building of God’s church, described by Paul as both a “field” being farmed and a building being constructed. In the next section he expands on this, warning all those who labour in the church that it is God’s church (not ours) – so be careful how you build it. 3:10 By the grace God has given me, I laid a foundation as a wise builder [architect/engineer], and someone else is building on it. But each one should build with care. And the first thing he reminds us is the obvious. We need to get the foundation right. 3:11 For no one can lay any foundation other than the one already laid, which is Jesus Christ. If you’re seeking to build the church, make sure you build it on the same foundation Paul laid, that of Jesus Christ. It may seem an obvious point, but it is possible to build a community around a good idea, or a concept like love and acceptance, or concern for the marginalised. Several years ago, I spent a few days at a conference in another state, at a bible college just like the one I teach at. Well, outwardly, at least. Except that their foundation was not the one laid by Paul. They explicitly denied the cross as an atonement, a payment of sin’s penalty. Even while preaching on the story of Jesus’ resurrection, they glossed over the event of the resurrection itself, and what it means. They focused instead on the gender inclusiveness of the first witnesses, and the task of making disciples of people from every nation. Unless a community is founded on the death and resurrection of Jesus Christ that paid the price for our rebellion against God, making it possible for members of that community to live in a restored relationship with God, it is not The Church. We can’t live in restored relationships with one another unless we’ve first made peace with God. 3:12-13 If anyone builds on this foundation using gold, silver, costly stones, wood, hay or straw, their work will be shown for what it is, because the Day will bring it to light. It will be revealed with fire, and the fire will test the quality of each person’s work. Paul’s using a building metaphor which needs some explanation. He lists six building materials: the first three are the sorts of expensive materials you would build a temple or important building out of (gold, silver, costly stones); the last three are the cheap stuff a person living in the first century would build their house out of (wood, hay, straw). Both types of materials make adequate buildings; the difference is in their enduring qualities. Gold, silver, and precious stones will survive the test of a fire; but we know that wood, hay, and straw won’t even keep out the big bad wolf. In Australia we regularly see buildings tragically destroyed by bushfires (“wildfires” if you speak American). Each time this happens, experts remind us that much of this is because we haven’t built in ways that withstand fire. European settlers built for European conditions. They are perfectly good houses to live in – until the fires start ripping through the Australian bush. 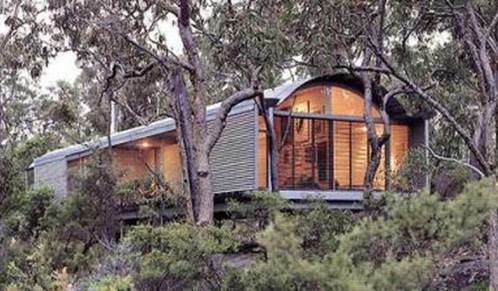 Instead, experts encourage the building of smart, bushfire-proof homes (pictured). These are partially embedded in the ground, and made out of fire resistant materials. Again, they work just as well as regular houses – but when the test of fire comes, they are the ones more likely to stand. Paul’s point is that we have a choice of materials when we seek to build God’s church: that which will perish when tested, and that which is im-perishable. Stepping out of the metaphor into real life, we run the risk of building from perishable materials when we try to grow God’s church through our own efforts. Through our programmes, or good marketing, or contemporary music, or techniques we learn from Americans… There’s nothing wrong with these things. And they can be helpful window-dressing: nick-nacks and ornaments that make the place a bit more appealing. Make it more understandable to the people we’re trying to reach. Encourage people to stick around long enough to hear about Jesus. All things to all people, as Paul says. But the danger comes in relying on these things to be the superstructure. They’re not. They might look OK for the moment, but when testing comes, they won’t be up to the job. They’re the fittings, not the framework. The building itself needs to be made of imperishable materials: things like prayer, the clear proclamation of God’s word, and a genuine desire to magnify God’s glory in reaching the lost. With what sort of materials do you seek to build your church?